Before we had giant supermarkets and hardware stores, people had to know how to make things themselves. Unfortunately, a lot of this knowledge has been lost and nowadays people are completely helpless to do things on their own. 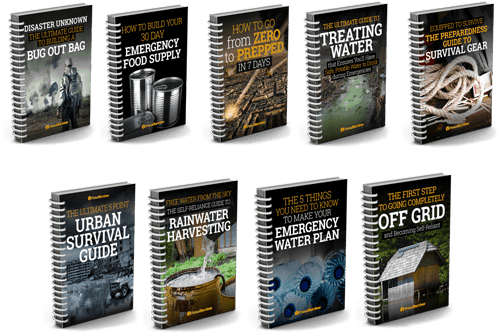 So, in an effort to increase our survival knowledge and skills, today I want to talk about all of the things you can do with pine tree sap. 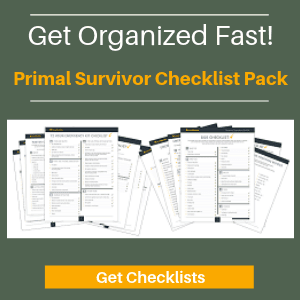 You never know when you are going to need this knowledge, so don’t let it get lost for good. Pine trees ooze resin when they get damaged. 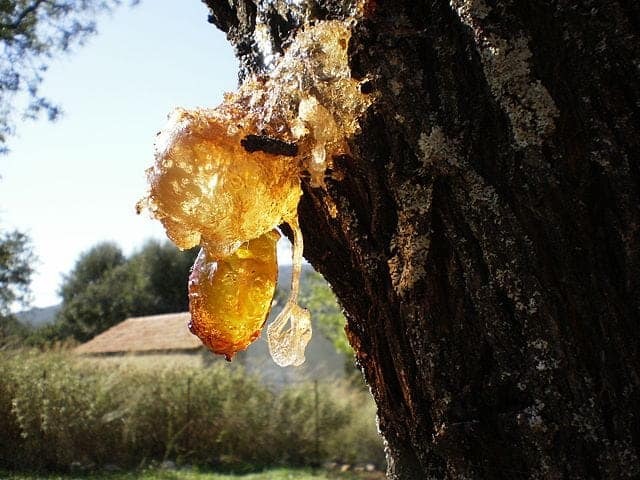 The resin has antibacterial properties which prevent the damaged tree from getting infected. In this same way, pine resin can also be used to heal our wounds. In addition to being antiseptic, pine sap is also anti-inflammatory and its stickiness helps it close wounds. It apparently also works well for healing eczema. To make pine pitch salve, you first need to collect some sap from pine trees. Using a double boiler, heat the sap into a liquid. Do NOT heat the pine sap directly over a flame because it is highly flammable! 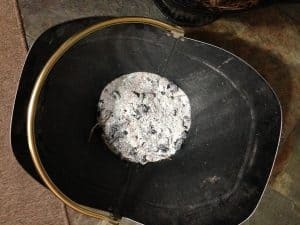 Strain the heated pine sap through a sieve to get out any dirt or bark. Next, you’ll want to mix the pine sap with olive oil. Again, you do this over a double boiler. The final step is to add some beeswax to make it firm. You can read detailed instructions about how to make pine sap salve here. As mentioned before, pine resin is really flammable. This makes it great for making primitive lamps. Note right away that you can NOT make a candle out of pine resin (even though there are lots of websites saying that you can). Even if you mix the pine resin (or pitch) with beeswax when making the candle, the pine resin will just ignite into a big ball of flames – not a slow-burning candle with a small flame at the wick. What you can do is make a “lamp” from pine sap or pitch. Here’s how. You’ll need a rock in a bowl shape and a bit of moss. Put some moss in the bowl to act as a wick. Surround the moss with some pine resin. Light the moss. Now you’ve got a lamp. Add more pine resin as it burns out. 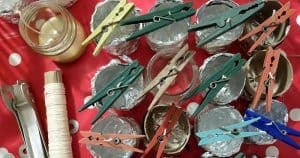 Alternatively, you can hollow out a piece of wood and stuff it full of pine resin or pine pitch and a little bit of fabric to act as the wick. Then light it and it will burn for a while, kind of light a primitive tea light. Pine pitch works great as a glue because it is so strong and sticky, plus it is waterproof. First, you have to make your pine pitch. The only problem is that pine pitch hardens when it dries. You’ll have to heat it up in order to use it – which can be a bit messy. The best solution for this is to put your pine pitch on the end of a stick. After making your pine pitch and while it is still liquid, swirl a stick into the liquid pitch. Then set the sticks aside to dry. When it is time to use the pitch glue, just use a bit of fire to heat up the pitch on the stick. The pitch will drip off onto whatever you want to glue. It is kind of like a primitive hot glue stick. Get yourself a long stick to use as the base of your torch. Next you will need some long, thin scraps of fabric or cotton rope. Wrap the fabric or rope around the top of your stick. Make some pine pitch. Dip the fabric/rope into the pitch and let it dry. Light it up and you’ve got yourself a torch which will burn for a fairly long time. *If you don’t feel like making pine pitch, you can just use melted pine resin instead. Alternatively, you can get a long, thick stick. Using a saw, cut some notches into one end of the stick. You can fill the notches with pine sap or pine pitch. Then just light it on fire. Mountain Man has a good description on how to do make a pine pitch torch here. Note that the pine pitch will drip down the torch, and it will be HOT. Do not hold onto this torch. It will need to be planted in the ground. Pine tar soap has been used for a really long time but obviously fell out of popularity once chemical soaps became available. Because of pine’s nature antiseptic qualities, it is a really great soap. Obviously, you are going to have to make pine tar before you can make soap. You can also use pine pitch. Use these instructions on how to make pine pitch – just don’t add the charcoal and other substrates! 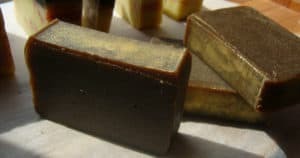 Here is a good recipe for how to make pine tar soap. And here is a video if you prefer to watch. In my opinion, this is by far the best survival use for pine pitch. Pine pitch is not water soluble, and it is incredibly durable. You can use it to waterproof all sorts of things, such as using it in the seams of your boots. Traditionally, pine pitch was used to waterproof boats and buckets. Apparently even Noah used pitch to waterproof the Ark! To apply pine pitch, you’ll need to heat it up first (use a double boiler for this so it doesn’t catch on fire!). Then just paint it on whatever you need to waterproof. Note that you don’t want to use pine pitch for waterproofing things that will be in high heat. The pine pitch will just melt off! It also gets a bit brittle in cold weather, so you’ll probably have to reapply each season. Have you used sap for anything? Do you think these traditional methods are worth preserving? Let us know in the comments or join the discussion on Facebook. Is there any tube medicine that is sold with tree sap included? Yes I believe it should be safe. Native Americans used to chew it as gum and for its anti-bacterial properties. 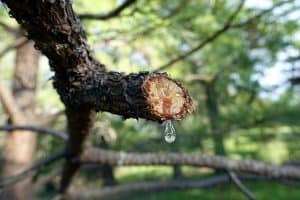 I am a denture wearer and was wondering about the possibility of using pine sap or resin as an adhesive in an outdoor/survival type situation. Could the glue method above be used? Is it safe to consume once it has been dried out and then reheated (wouldn’t be eating it but it would be absorbed somewhat through the gums)? Or would just using it straight from the tree work? Can’t really see this working too well. 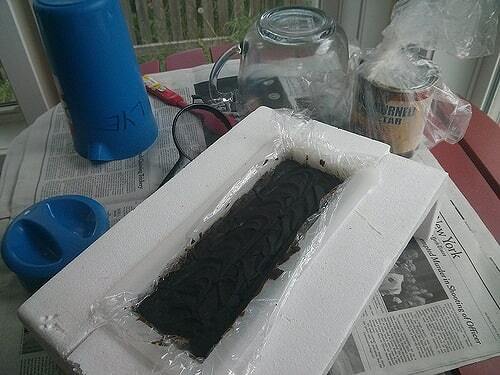 The glue hardens when it dries so needs to be heated before application, I expect it will be too uncomfortable to use. I can’t give you a definitive answer on this as I don’t know for sure that the fumes are safe to breath. My gut instinct says it should be fine although you will need to do your own research before you make a decision.